Photography is often seen as a way to copy reality. Pictures, or ‘stills, are frozen images of parts of the environment that have attracted the photographer’s attention. Often they are unique moments that show up, and spontaneously catch the eye of the photographer. These moments do not enter our head randomly, but are the result of selection. As the famous French photographer Cartier-Bresson has put it: Reality offers us such wealth that we must cut some of it out on the spot, simplify. Yo put it even more simply: a picture often comes from the merging of an idea and an image. Distortion is part of the game A picture need noalways be an exact copy of the real world. Think of the paintings of some great artists: the hallucinating painting of a starry night above the Provence by van Gogh. Or the paintings of Rembrandt with their magic ‘clair obscur’: the enhanced lighting of a group of persons against a darker background. Here the artist has deliberately chosen to let his inner sense of beauty dominate the visual scene. The same principle seems to holds for the underwater photographer that deliberately exaggerates aspects like lighting, color and perspective. Or even adds or leaves out details of the environment. Think of the wide angle photographer with his fish eye lens, and the macro photographer creating that beautiful ‘bokeh’ behind its goby or pigmy seahorse. Special techniques. There are several techniques or rather ‘tricks’ to create special effects in your underwater pictures. I already mentioned the use of the fish-eye lens to exaggerate the perspective. Other examples are: long exposure, remote strobe lighting, panning and spins and double exposure. It’s a bit like van Gogh transforming a landscape. Hiding a torch or a remotely controlled strobe in a shipwreck can add a magical touch to the often darkish and gloomy landscape of a sunken ship. In above-water photography double exposure is often used to produce surreal or ‘psychedelic’ pictures. The picture is not the real image but not an overlay of two images taken at different moments. For mixing a macro exposure with a wide angle shot under water you need two different lenses on two separate dives. The wide angle and macro shots are then overlayed during the editing process. Double exposure can also be performed directly in the camera without changing the lens and making two consecutive shots. When done cleverly, it hard to tell from the image alone if it was a genuine single exposure (e.g. a Close Focus Wide Angle shot) or a double exposure composition. Photoshop also offers several tools to enchant or 'fool' your public, for example using filters or copying a butterfly fish couple to get a whole bunch of butterflies against a nice blue background (see my picture above). Nothing wrong with that, as long as you tell the public about the trick you have used. Helping nature a hand Making pictures underwater is not an easy job. The sea is not a photo studio but a difficult and ever changing environment. Even in ideal conditions, your favorite subject may not show up, and when it finally does will not ‘behave’ as it should. The goby or anemone fish may not be in the right position, or it may be hard to find that sharp focus of its eyes. The best strategy then is to take multiple shots or ‘samples’ of your subject, and select the best after you have returned to the surface. With rapidly moving subjects like dolphins one simply has no other choice than to just click away at very short intervals and fast shutter speeds. Underwater photography is often a question of waiting until the ideal moment arrives. To make things at bit easier we sometimes help these moments to arrive sooner by manipulating the underwater environment. With big predators like sharks that normally tend to keep their distance, baiting has proven to be a relatively safe and effective way to bring them closer to your lens. It can also produce a beautiful two layered picture by hiding the bait under a sea fan and wait for the shark to pass by on the background. The critter manipulation debate If the UW subject is a very small and rare subject like a critter, but not in the ideal position some people are tempted to move or replace the little creature. I must confess that I also once replaced a red sea star (Echinaster sepositus) in the Mediterranean from its original position on the sand, to a higher place to get in the blue background. In some Asian ‘critter havens’ photographers have the habit of poking a tiny goby while sitting on a coral while taking photos, disturbing sea urchins and shrimps living on it. Dive guides have been seen moving nudibranches to please the photographers. Here, 'helping nature a hand' takes the form of manipulation in the literal sense, namely to ‘take by hand’. Maybe it’s something we should not get too much upset about, as long there is no damage done to the reef and its fragile inhabitants. Still, critter manipulation violates the generally respected underwater code : ‘don’t touch parts of the underwater world’, be it a coral, a sea fan or a small fish. And it remains a quick and unprofessional way to get a result that perhaps will give you many likes on the facebook, or even a medal in a contest. It is also often hard for the judges to know whether the critters have been "re-arranged" to suit the photographer. 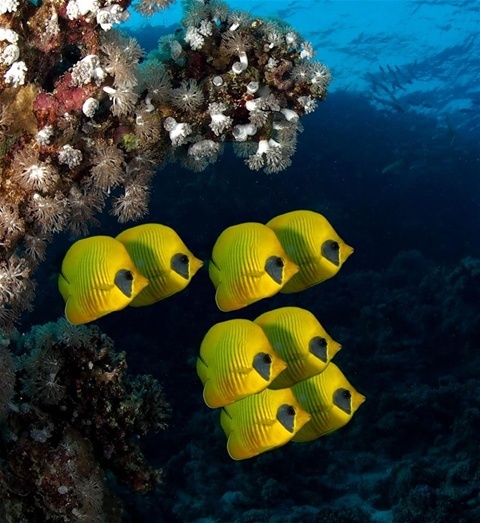 Apart from the ecological issue, the 'fair competition' principle has been an important argument for those that participate in underwater photo competitions. Should critter manipulated pictures be allowed to enter these competitions? The debate is reminiscent of the commotion around the use of performace enhancing drug in cycling, where 'users' seem to have an advantage above 'non users'.